The 13th College All-Star Game on August 23, 1946 featured a transplanted defending NFL Champion, the Los Angeles Rams, facing an All-Star team coached by Bo McMillin of Indiana, who had guided a previous group of All-Stars to a win in 1938. As the Cleveland Rams in 1945, Head Coach Adam Walsh’s team had gone 9-1 in winning the Western Division and then edged the Redskins for the league title. Rookie QB Bob Waterfield excelled in the club’s new T-formation offense that also featured end Jim Benton and a good group of running backs. New for 1946, in addition to the franchise’s location, was HB Kenny Washington who, along with end Woody Strode, broke the NFL’s color line, plus former Heisman Trophy winner HB Tom Harmon, who had returned from military duty. The All-Stars had a talented roster that included tailback Otto Graham from Northwestern, Tulane HB Dub Jones, and FB Pat Harder and HB Elroy “Crazylegs” Hirsch from Wisconsin (pictured above; Hirsch also played at Michigan during his stint as a Marine Corps officer candidate). Due to relaxed eligibility rules during World War II that allowed underclassmen to participate, several players were appearing in the contest for the second or third time. There were 97,380 fans in attendance at Chicago’s Soldier Field for the Friday night game. In the first quarter, after the Rams were stopped at the All-Star 30, the collegians struck quickly. The first play of the series gained two yards and then “Crazylegs” Hirsch took a pitchout and tore off to his right on a 68-yard touchdown carry, outrunning the Rams secondary and eluding a last-gasp tackle at the ten yard line. Pat Harder added the extra point. In the second quarter, the Rams mounted their greatest threat, reaching the All-Star nine yard line after Bob Waterfield connected with Jim Benton for a 27-yard gain, but they came up empty and the score remained 7-0 at the half. The Rams appeared to be flat, blowing several scoring opportunities in the first half, particularly after All-Star fumbles. On three occasions they were inside the All-Star 20 yard line and in the collegians’ territory two more times but failed to put points on the board in each instance. The All-Stars were well prepared to defend against the passing game and as a result Waterfield had few open targets. LA’s typically strong aerial attack was successful only sporadically and the running game could not adequately compensate. In the third quarter, and after a series by the Rams that ended with a failed 39-yard field goal attempt, Hirsch struck again as he grabbed a long, arching pass from Otto Graham in full stride for a 62-yard TD. The collegians had taken over on their 20 and gained 18 yards in three plays. Graham’s pass traveled 37 yards in the air and Hirsch got past DHB Jim Gillette to score. Once again, Harder kicked the extra point to make it 14-0. In the fourth quarter the desperate Rams inserted some of their newcomers to try to turn things around. 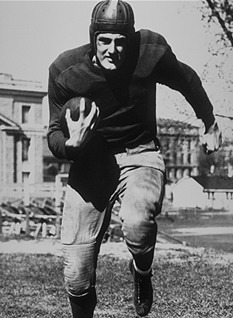 Tom Harmon ran the ball once for an eight-yard loss and suffered a dislocated elbow. Kenny Washington attempted to throw an option pass from behind his own goal line and was tackled by Yale DE Paul Walker for a safety that capped the scoring. The All-Stars came away with a stunning 16-0 win. Apart from the two long scoring plays, the All-Stars were hardly dominant on offense. They outgained LA by 227 yards to 167 and the Rams actually led in first downs by 7 to 5. The collegians were guilty of sloppy play as they fumbled the ball seven times and the Rams recovered four of them. LA was unable to capitalize, however, and Bob Waterfield had a rough performance as he completed 7 of 16 passes and had two intercepted. It was the fourth win for the All-Stars in the series, against seven for the pro champs and two ties. Bo McMillin became the first coach to twice lead the All-Stars to victory. Along with Hirsch, tackle Martin Ruby from Texas A & M received accolades as one of the stars of the game. In the ensuing NFL season, the Rams went on to finish 6-4-1 and placed second in the Western Division. Waterfield led the league in pass attempts (251), completions (127), and touchdown passes (17). “Crazylegs” Hirsch, who ironically enough had been chosen by the Rams in the first round of the 1945 NFL draft, instead joined the Chicago Rockets of the new All-America Football Conference (AAFC). He started out as a halfback but, after an injury-filled sojourn that concluded with his suffering a severe head injury during the ‘48 season, joined the Rams. Starting out as a halfback who was often flanked out wide, Hirsch moved to end and became a record-breaking receiver over a career that ended in 1957. The same flashy skills that he used to such advantage in the 1946 College All-Star Game were evident during his years in the NFL and he caught 343 passes for 6299 yards and 53 touchdowns. In 1968 Hirsch was enshrined in the Pro Football Hall of Fame.